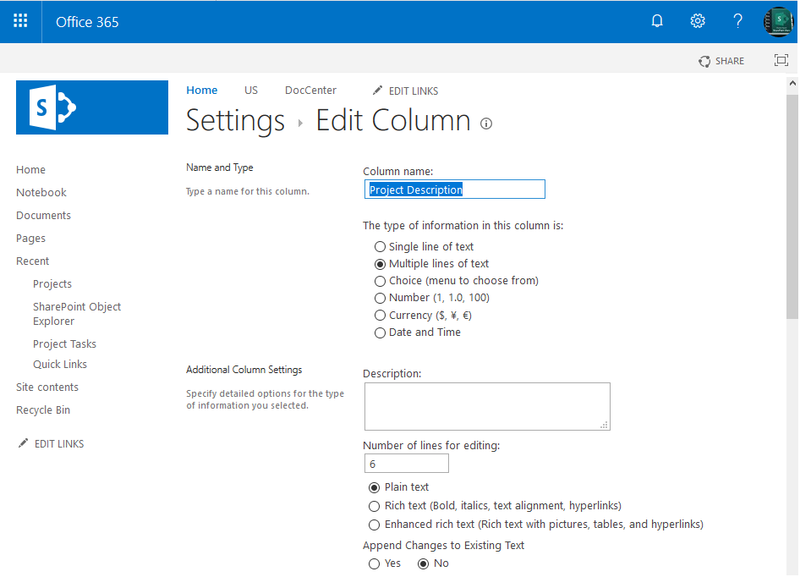 Requirement: Change Multiple Lines of Text Field type to Rich Text in SharePoint Online. How to Change Multiple Lines of Text Field Type from Plain Text to Rich Text? Go to the list or site where the target column exists. Get in to the column settings. Select the column type to "Rich Text (Bold, italics, text alignment, hyperlinks)" or "Enhanced rich text (Rich text with pictures, tables, and hyperlinks)" as per your requirement. #Function to Set Multiple Lines of Text Field Type to "Rich Text"
#Function to convert Multiple Lines of Text Field Type to "Rich Text"
Invoke-LoadMethod -Object $List -PropertyName "AllowDeletion"
To make a Multiple lines of text field type to enhanced rich text field, we should convert the field to "Rich Text" first (So that the "RichTextMode" attribute populates) from plain text and then change the field schema. #Function to Set Multiple Lines of Text Rich Text Field Type to "Enhanced Rich Text"